Insect borers are likely to be more numerous than normal for the next several years. During extended dry conditions, trees lose root mass, resulting in a reduction of sap flow and dieback of branches. The reduced sap flow provides opportunities for borer attack that would not be present otherwise. This increase is likely to be noticeable next year and will build for about three years. Borer infestations are likely to fall over the following two years until reaching normal levels around 2018. Tree dieback and death due to the drought will be more acceptable to clientele over the next couple of years than later. Many trees will take three years to die, and some will hang on until five years after the drought. These later deaths and accompanying borer attacks will be difficult for clientele to understand and accept. In your newsletters or other communications with your clientele, bring up these possibilities occasionally over the next few years so that it comes as less of a surprise. Insect borer adults are tuned into aromatic chemicals released by trees with dieback. Generally, this comes from the portion of the tree with storm injury, other limb breakage, frost cracking, or pruning wounds. Trees dying from old age produce similar compounds. These chemicals indicate reduced sap flow. 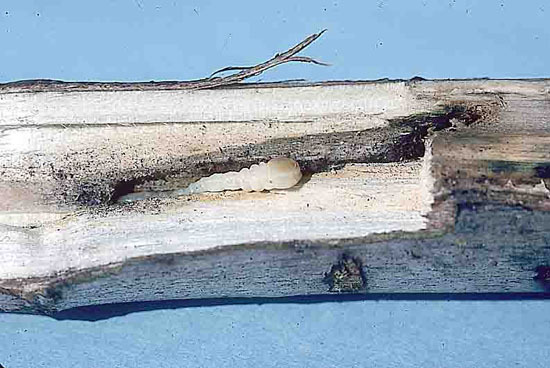 Eggs laid into niches made by adult beetle borers or other small wounds on healthy trees are likely to be washed out of the wound by strong sap flow. Eggs managing to stay in the niche or wound will hatch into larvae that will likely to be drowned in sap or be crushed by internal sap pressure. While these natural defense mechanisms by the tree are effective in eliminating borers, it is also in the borers' best interests to not expend resources and energy by laying eggs into unsuitable hosts. Selecting trees or parts of trees that are dying are a better option for the adult borers. Bark beetle infestations will increase along other beetle borers. Flatheaded appletree borer attacks crabapple, hawthorn, serviceberry, mountain ash, and ornamental pears, plums, and cherries. It also attacks maple, ash, and a variety of other trees. Two-lined chestnut borer, another flatheaded borer, attacks declining chestnuts, oaks, and beeches. Redheaded ash borer is a roundheaded borer that attacks many tree species in addition to ash. Other, more specific roundheaded borers include linden borer in linden, cottonwood borer in poplars and cottonwood, and ash and privet borer in ash and privet. Flatheaded appletree borer larva and damage.